Comments Off on Post-sand extraction restoration of Banksia woodlands, Swan Coastal Plain, Western Australia. 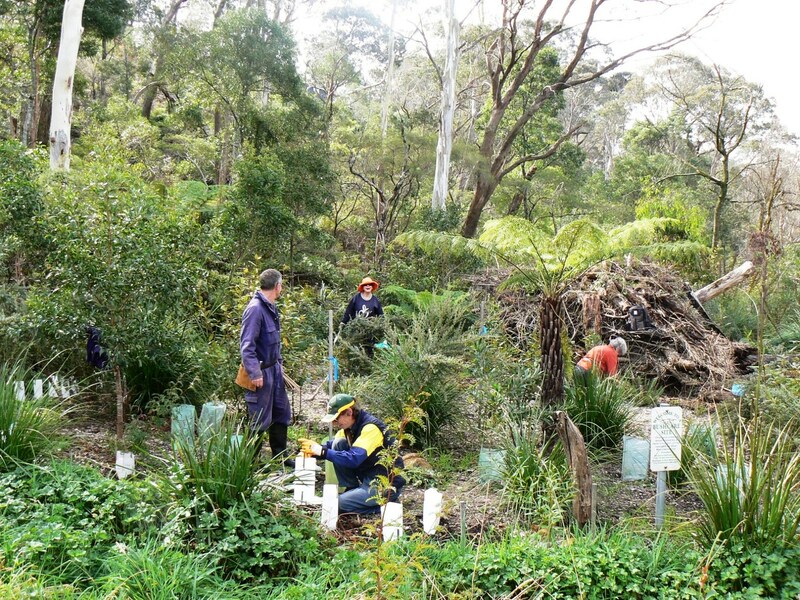 Twenty-one years of plantings in the Lurg Hills, Victoria, have seen a consolidation of the work described in the 2009 EMR feature Regent Honeyeater Habitat Restoration Project. The priorities of the Project are to protect and restore remnants and enlarge them by add-on plantings. Together, this work has protected relatively healthy remnants by fencing; restored depleted remnants by planting or direct seeding; and revegetated open areas that had been cleared for agriculture. Other restoration activities include mistletoe removal, environmental weeding, environmental thinning; feral animal control, kangaroo reduction, nest box placement, and systematic monitoring of a range of threatened and declining woodland birds and hollow-dependent mammals. Updated outputs since 2009. A further 540 ha of private land has now been planted (150 additional sites since 2009). This means the total area treated is now 1600ha on over 550 sites. The oldest plantings are now 19 years old and 10m high (compare to 12 years old and 6m high in 2009) (Fig 1). Fig. 1. Ecosystem attributes developing in 19-year-old planting at Dogleg Lane (Foster’s). Note pasture grass weeds are gone, replaced by leaf litter, logs, understorey seedling recruitment, open soil areas. Improvements in genetics and climate readiness. As reported in 2009, seed collection is carried out with regard for maximising the genetic spread of each species, to prevent inbreeding and more positively allow for evolution of the progeny as climate changes. This has meant collecting seed in neighbouring areas on similar geological terrain but deliberately widening the genetic base of our revegetation work. We are also attempting to create as broad bio-links as possible so that they are functional habitat in their own right (not just transit passages). This may allow wildlife to shift to moister areas as the country dries out. With a species richness of 35–40 plant species for each planting site, we also enable natural selection to shift the plant species dominance up or down slope as future soil moisture dictates. 2016 Update: In recent years we have engaged with geneticists from CSIRO Plant Division in Canberra, to improve the genetic health of our plantings. Many of our local plants that we assumed to be genetically healthy, have not recruited in our planting sites. For example, Common Everlasting (Chrysocephalum apiculatum) produces very little if any fertile seed each year because it is sterile to itself or its own progeny (Fig 2 video). In fragmented agricultural landscapes, it seems that many of our remnant plants have already become inbred, and it is seriously affecting fertility, form and vigor. The inbreeding level has affected fertility in this particular case, but we have several other cases where form and vigor are seriously affected as well. Seed production area. We have now set up a seed production area (seed orchard) for about 30 local species that are ‘in trouble’, to ensure that the plants have sufficient genetic diversity to reproduce effectively and potentially adapt, should they need to as a result of a shifting climate. This will allow these populations to become self-sustaining. Each species is represented in the seed production area by propagules collected from typically10-15 different sites (up to 20kms and sometimes 50kms distant) and as many parents as we can find in each population. We aim for at least 400 seedlings of each species, to ensure the genetic base is broad enough to have the potential for evolution in situ. The planting ratios are biased towards more from the bigger populations (that should have the best diversity), but deliberately include all the smaller populations to capture any unique genes they may have. We plant each population in separate parallel rows in the seed orchard to maximise the cross pollination and production of genetically diverse seed for future planting projects. We have noticed that the health of some of these varieties is greatly improving as a result of increasing the genetic diversity. On one site we direct-sowed Hoary Sunray, sourced from a large population, and it has since spread down the site very quickly (Fig 3). Fig 3. Small sub-shrubs and herbaceous species are generally not planted in stage 1 of a project, as the weed levels are often too high for such small plants to succeed. These plants are only introduced in stage 2, when the weeds have diminished up to a decade later. This approach has been very successful with direct seeding and planting some of our rarer forbs. Recruitment of Eucalypts now evident. Nearly 20 years on from the first plantings, we can report that quite a number of sites have eucalypts old enough to be flowering and seeding, and some of them are now recruiting. We are delighted that our early efforts to broaden the planting genetics are demonstrating success with such natural processes (Figs 1 and 3). Ironbark recruitment from our plantings commenced in 2014 and Red Box commenced in 2015. Recruitment can also be seriously affected by herbivore problems, particularly rabbits. In recent years we have been undertaking careful assessments of rabbit load on a potential planting site and have gained some advantage by deploying an excavator with a ripper attached to the excavator arm. The excavator allows us to rip a warren right next to a tree trunk (in a radial direction), or work close to fence without damaging either. We’re finding this is providing a very good result. On one site we suspected there were a few warrens but it turned out to be just short of 30 warrens within 100 m of the site – each with 30-40 rabbit holes. After ripping all of those, we ended up with activity in only 2 of the warrens, which were then easily retreated. We have had such good results with the rabbits on some sites that we are trialing planting without tree guards – it’s much more efficient on time, labour, and costs. And adjacent to bush areas, where kangaroos and wallabies are a significant threat to plantings, this process has an extra advantage. It seems that macropods learn that there is something tasty in the guards, so a guard actually attracts their attention. Our initial trials are producing some good results and given us confidence to expand our efforts with thorough rabbit control. Faunal updates. An important objective of the project is to reinstate habitat on the more fertile soils favoured for agriculture, to create richer food resources for nectarivorous and hollow-dependent fauna including the Regent Honeyeater (Anthochaera phrygia). In 2009 the Regent Honeyeater was nationally Endangered and was thought to be reduced to around 1500 individuals. By 2015, it was thought to be reduced to 500 individuals, and so has been reclassified as Critically Endangered. Regent Honeyeaters have turned up in recent years in gully areas where the soils are deeper, the moisture and nectar production is better, and there is a bit more density to provide cover against the effects of aggressive honeyeaters like the Noisy Miner (Manorina melanocephala). The Regent Honeyeaters have been able to remain on such sites for around for a week or more, but have not bred on the sites to date. But breeding has occurred about 15kms away on the eastern edge of our project area. Radio-tracking showed that these breeding birds were some of the captive-bred birds released at Chiltern 100km further NE, and that the birds came towards Lurg after the Chiltern Ironbarks had finished flowering. We consider it to be just a matter of time before the Regent Honeyeaters will find the many habitat sites we’ve planted on higher productivity soils in the Lurg area. Formal monitoring of Grey-crowned Babbler (Pomatostomus temporalis temporalis) for the past last 13 years has documented a rapid rise (due to some wetter years) from 60 birds in 19 family groups to approx. 220 birds in 21 family groups. There is also exciting evidence that the endangered Brush-tailed Phascogale (Phascogale tapoatafa) is returning to the Lurg district. The distinctive shredded Stringybark nests are now found in scores of our next boxes (up to 10km from the site of our first records of 2 dead specimens in the south of our project area in the mid 1990s). This dramatic population spread is presumably a direct result of our carefully located corridor plantings that have bridged the habitat gaps all across the district. Increased social engagement. In the last 6 years we have increased the number of visits to planting days by 50 per cent. There has been a steady growth in the number of new local landholders involved and the total number is now 160 landholders engaged, compared with 115 in 2009. Everyone we come across knows of the project and anyone new to the area hears about it from one of their neighbours. Very few people (you could count them on one hand), say they would rather not be involved. In fact we increasingly get cold calls from new people who have observed what has happened on their neighbour’s place and then phone us to say they want to be involved. It’s a positive indication that the project is part of the spirit of the area. This was further confirmed by the inclusion, of a very detailed Squirrel Glider (Petaurus norfolcensis) mural in a recent street art painting exhibition. The permanent artwork is the size of a house wall, and situated prominently in the heart of the parklands of Benalla. Much of our work has relied heavily on volunteers, with a total of 10,344 students and 24,121 community volunteers involved over the past 21 years. City folk have fewer opportunities to be in nature, with the bushwalking clubs, university students and scouts in particular, really keen to come and roll up their sleeves. Typically about 17 to 20 of the local schools, primary and secondary, help us with propagating the seedlings at the start of each year and then planting their own seedlings back out into the field in the winter and spring. And we are increasingly getting interest from metropolitan schools that come to the country for a week-long camp. Some of the schools even have their own permanent camps up here and they want to be involved with our hands on work too. “It’s simply part of our environmental responsibility”, is the way they express it. 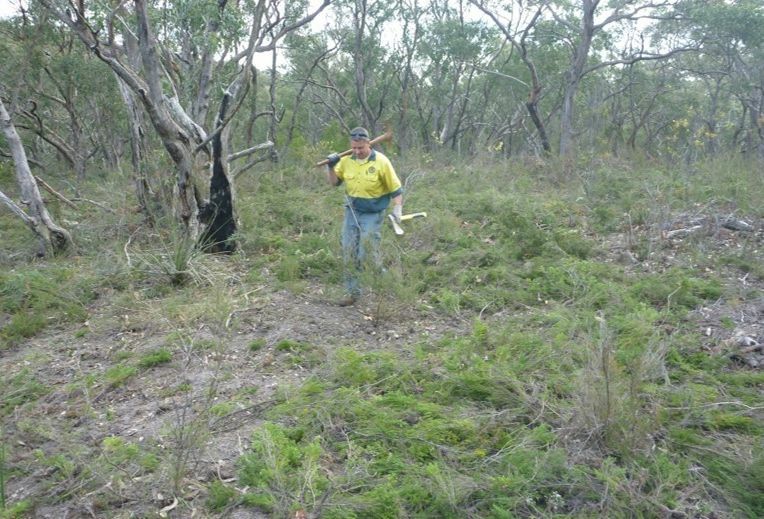 Seed production and direct seeding to restore grassy understorey diversity at Mount Annan, NSW. 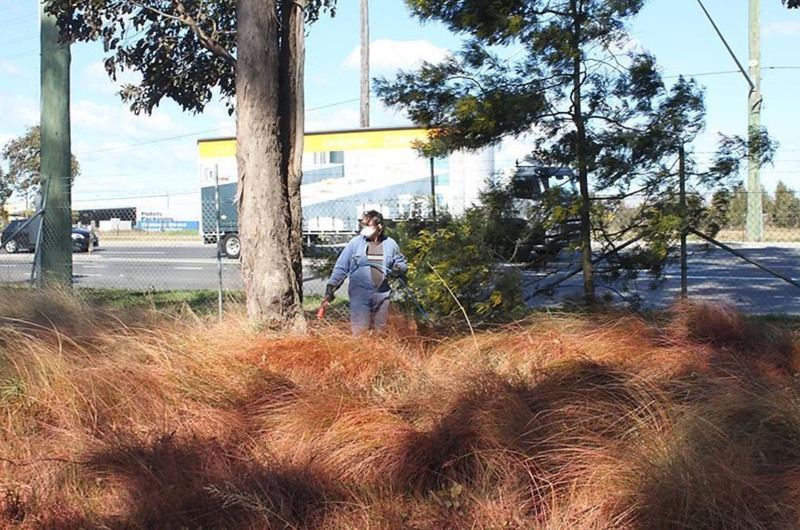 Posted on 5 March 2016 by teinm | Comments Off on Seed production and direct seeding to restore grassy understorey diversity at Mount Annan, NSW. Need for restoring grassy diversity. The rapid spread of African Olive (Olea europaea ssp. cuspidata) in the Cumberland Plain region of western Sydney in recent decades is now a significant conservation concern (Figs 1 and 2). Cumberland Plain Woodland (CPW) is now listed at the state and federal level as a critically endangered ecological community, and African olive invasion is recognised as the greatest invasive threat to CPW, and listed under the NSW TSC Act as a Key Threatening Process. 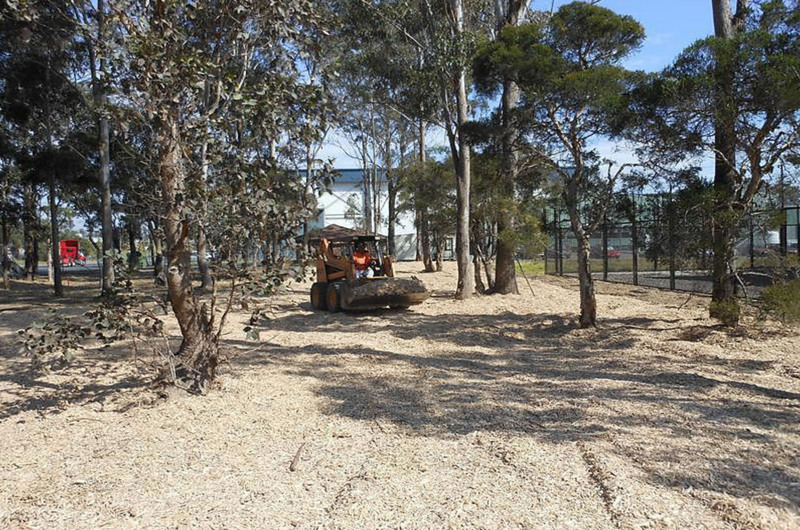 Dense monocultures of African olive are now established at a landscape scale in western Sydney, and there has been considerable use of mechanical mulching (‘forest mowing’) to control these highly degraded CPW remnants/monocultures (Fig 3). 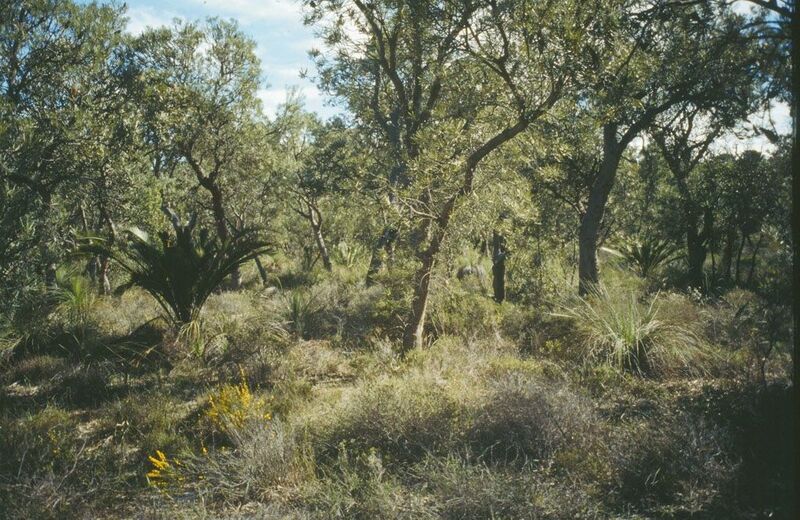 Often only remnant trees remain, and once these dense olive infestations are controlled, land managers are faced with several years of follow up olive control, degraded native soil seedbank and a profusion of annual weeds. The Australian Botanic Garden, Mount Annan (ABGMA) has completed over 40 hectares of mechanical control of African Olive since 2009. Recent research (Cuneo & Leishman 2015) has indicated that a ‘bottom up’ approach restoration using native grasses as an early successional stage has potential to restore these transitional landscapes and achieve a trajectory towards CPW. Like many landscape scale ecological restoration projects ABGMA faces a shortage of native grass seed, however a successful NSW Environmental Trust application provided the funding support to develop a 1500 sq metre native grass seed production area as part of the Australian PlantBank landscape. The key objective was to grow high quality weed free native grass seed (of known germinability) to direct sow on degraded African olive sites where the native grassy understory had been lost. Seed production area. The seed production area was established by tubestock planting of four key local grasses, Dichelachne micrantha (Plume grass), Microlaena stipoides (Weeping meadow grass), Chloris truncata (Windmill grass) and Poa labillardieri (Tussock grass) (Figs 4 and 5). Seed was wild source collected from CPW and grasslands within ABGMA, which provides a reference vegetation type and condition to guide restoration. The seed production area which was irrigated and fenced to exclude rabbits was highly productive, even during the first summer season. Both hand and mechanical harvesting were used, and the total output over the 2014/15 summer was impressive 118 kg of seed material harvested. All seed batches were germination tested at PlantBank which indicated a total output of over 13 million viable seeds from the first harvest season. Direct seeding of grasses. Restoration challenges included large areas, profuse annual weeds and competitive olive seedlings on the transitional post-olive sites. A decision was made to focus the direct seeding across one fifth of the treatment area in a series of cultivated 2m wide strips at 8m spacing. The strips were created along contours to limit the erosive potential of the prepared areas. These seeded strips could then be managed in a similar way to surrounding cleared areas with broadleaf selective herbicide and slashing. Seeded grass strips were prepared using a small track machine with surface tilling attachment to provide good soil/seed contact (Fig 6). Seed material (seed/stalks) were combined with compost (Fig 7) and sand and hand broadcasted. In an effort to create an ‘in situ’ seed production area and robust native grass populations, harvested grass seed was then used to high density (up to 3300 seeds/m²) direct sow a total of 5km x 2m wide strips throughout 5 hectares of cleared African olive sites at ABGMA in March 2015. Favourable conditions during autumn 2015 resulted in excellent field germination, with established seedling densities of up to 608 seedlings/m² observed after 10 months (Fig 8). The combination of surface tilling and dense sowing rates has resulted in a dense and competitive grass layer, however some further broadleaf weed control along the strips will improve long term grass density and establishment. These native grass strips will provide a ‘nucleus’ grass seed source for these degraded areas, maintaining soil stability, improving ecological resilience and accelerate the regeneration of these degraded areas. Lessons learned. Using known quality seed and achieving seed/soil contact through surface tilling was important to success, as cleared olive areas have a heavy mulch layer which limits seed contact. The use of both C3 and C4 grasses in the direct seeding mix worked well and is recommended, particularly for autumn sowing where cool season C3 can establish a quick cover followed by C4 grass establishment in summer. Some mechanical wild grass seed harvesting is also done at ABGMA, however practitioners should be aware of the risk of grassy weed contamination. Overall the project was relatively labour intensive, but some mechanisation of seed spreading could be achieved with a compost spreader. Steep terrain at ABGMA is a limiting factor for some machinery, and hand broadcasting can be a practical option. Future directions would include scaling up the size of seed production areas, and refining mechanical harvesting techniques. Grass seed strips will be progressively managed, and seed either mechanically harvested or slashed to spread seed across the site. Once grasses are well established, the next phase will include direct seeding of CPW shrubs and trees. The well prepared and presented seed production area with mass plantings of native grasses, attracted considerable visitor interest at ABGMA and became a focus for several practitioner field days on olive control and ecological restoration. Acknowledgements: Implementation of this NSW Environmental Trust project has relied significantly on working with industry partners, Greening Australia (Paul Gibson-Roy, Samantha Craigie, Chris Macris), Cumberland Plain Seeds (Tim Berryman) and Australian Land & Fire Management (Tom McElroy) who have bought additional technical expertise as well as on-ground implementation. Comments Off on Seed production and direct seeding to restore grassy understorey diversity at Mount Annan, NSW. Introduction. A study investigating the response of bird assemblages to mosaic burning is being conducted on 60,000 hectares private nature reserve in the Brigalow Belt bioregion of Queensland (Fig 1). 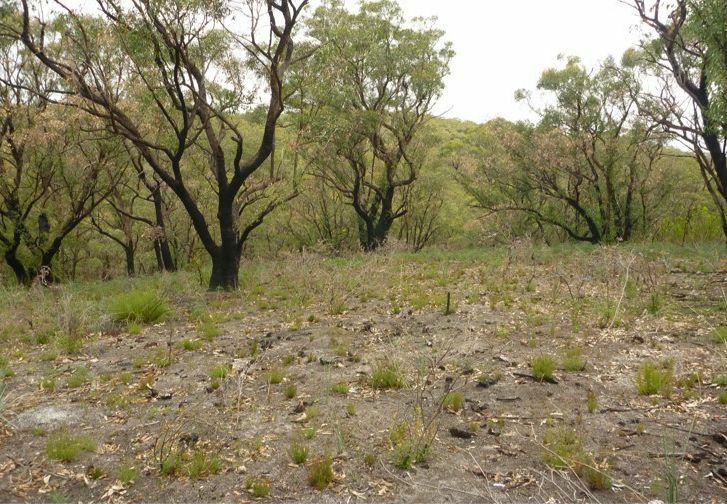 The Brigalow Belt has recently experienced high rates of native vegetation clearing, motivating Bush Heritage Australia (BHA) to purchase and protect the property in 2001. The subsequent removal of cattle and horses from Carnarvon Station Reserve has increased grass and herb biomass. The seasonal surge in productivity the property now experiences however, increases the potential for more intense, frequent and extensive fires in hot, dry conditions. The risk of such wildfires needs to be managed, and a common approach to such management is prescribed burning. But how to ensure nature conservation objectives are still met? 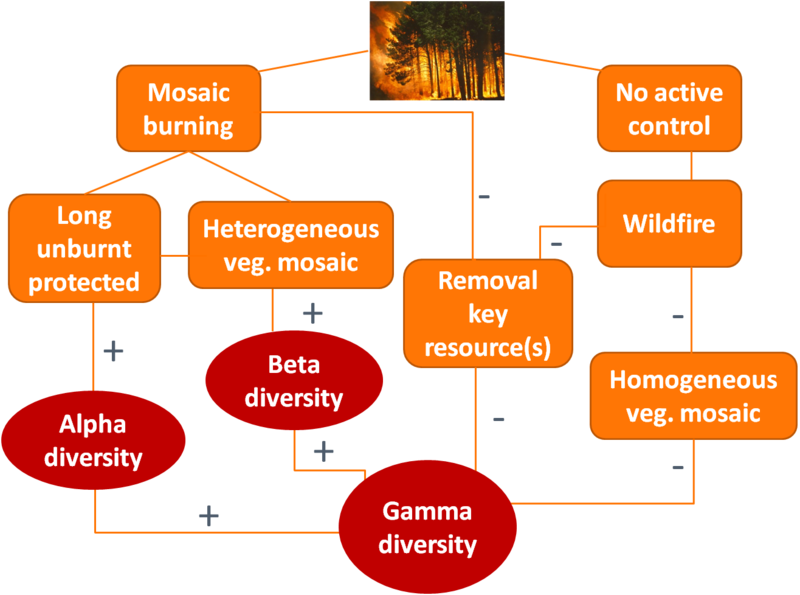 In fire ecology, there is a common assumption that if we introduce a range of burn conditions to produce a mosaic of patches with different fire histories (pyrodiversity) – then the resulting diversity in fire histories and the greater representation of successional stages of vegetation is expected to accommodate more species in a given area (Fig. 2). Reducing the spatial scale at which fire history turns over- the “breaking up” of country- is also known as the patch mosaic burning approach. Whilst we assume that pyrodiversity will give us increased habitat diversity, and therefore greater animal diversity, there is uncertainty as to the scale (alpha, beta or gamma diversity) at which pyrodiversity might influence biodiversity (Fig. 3). Alpha diversity is the total number of different species within a site or habitat; beta diversity is the difference in species composition between sites or habitats; and gamma diversity is the number of different species across all sites or habitats in the area of interest. 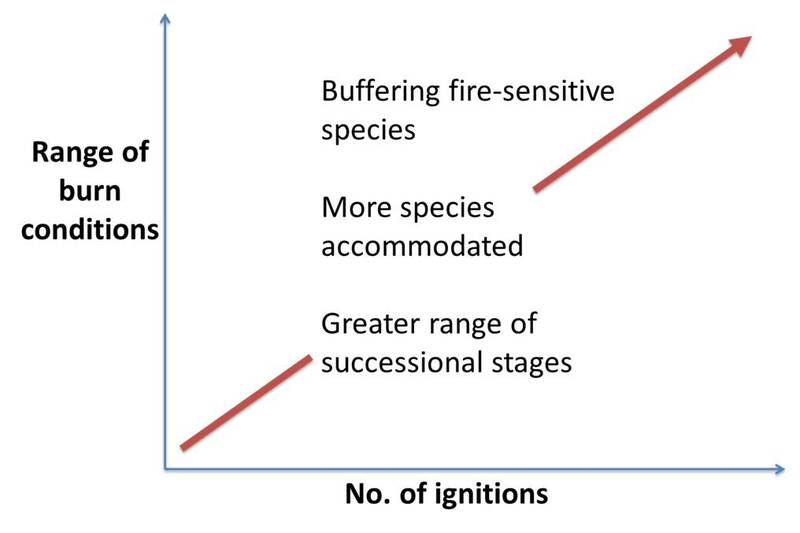 At what spatial scale do we see the benefit for birds of mosaic burning (Fig. 3)? Response of different bird foraging guilds to mosaic burning, at both the landscape- and local-scale. So what did we find? The diversity of fire regimes in the 100-ha landscape did not correlate with average site (alpha) or landscape- (gamma) diversity of birds. Rather, the total area of longer-unburnt vegetation was important for increasing bird richness at the landscape-scale, and sites in longer-unburnt vegetation had more species. Although areas burnt in prescribed burns supported lower bird diversity compared to long-unburnt areas, prescribed burns are still necessary to reduce the risk of extensive wildfire. Such burns should focus on breaking up areas of high fuel at the beginning of the dry season (Fig. 4). The extent of long-unburnt vegetation that can be maintained with careful fire management is yet to be determined, but its importance as bird habitat is clear. Acknowledgements: This work could not have been completed without funding and logistical support provided by AndyInc Foundation, Bush Heritage Australia and UQRS. Thanks to Peta Mather and Donna Oliver who assisted with field work. This study was carried out with approval from the Animal Ethics Committee at the University of Queensland (approval no. SGPEM/325/11/UQ). Introduction. 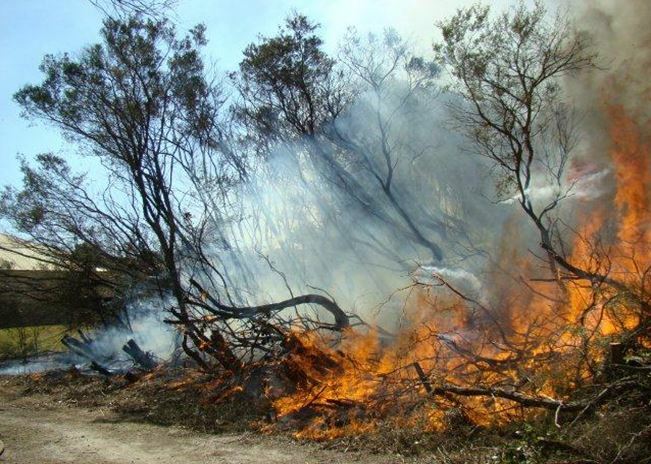 The purpose of much of the prescribed burning work we do in the Mount Lofty Ranges in South Australia fuel reduction to mitigate the risk of bushfire. But we also do a lot of work, including burning, purely for the purpose of biodiversity conservation. Being so close to Adelaide all of our Parks are highly fragmented and have a strong history of disturbance such as mining and grazing. Within our team we have a very strong focus on weed control and we do this routinely for all of our burns. There are two reasons we have such a focus on weed management and no longer just go in and burn and walk away. The first is to ensure that the vegetation condition does not deteriorate and the second is to ensure that fuels don’t increase due to woody weeds. In many cases this is leading to improvements in quality of the sites. Methods. Our burns are done under a prescription which specifies certain weather parameters for which the burn can be carried out safely. Our sites are typically between 5 and 200 hectares, often adjacent to built assets (Fig 1). Mapping both before a burn and 4 years after a burn allows us to monitor progress. We map most of our burns on foot, assessing native vegetation condition, weeds present, their distribution and their cover throughout the proposed burn site. We undertake this with a view to gaining a clear picture of what we’ve got to deal with during the burn and post-burn. Our planning begins 6-18 months prior to a burn to give us plenty of time to carry out works that are often seasonally dependent. Fig 1. Example of a typical Adelaide Hills conservation area on the urban fringe. 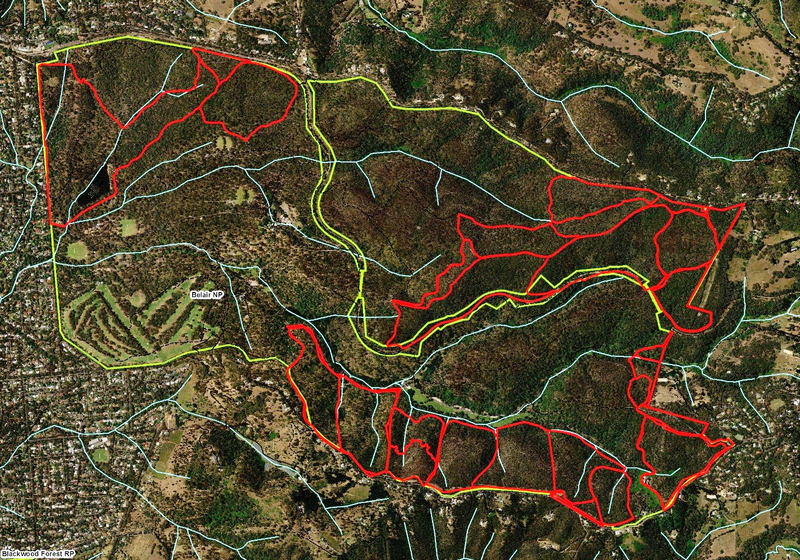 Red areas show prescribed burns either completed or in the planning phase. Examples and results to date. In most of our situations pre-burn control greatly increases the efficiency of any post-burn work and overall makes our work easier. Example 1: Figures 2 and 3, shows a significant reduction in the distribution of Gorse (Ulex europaeus) at an otherwise relatively intact site after the burn, improving the condition of the bush in this area. 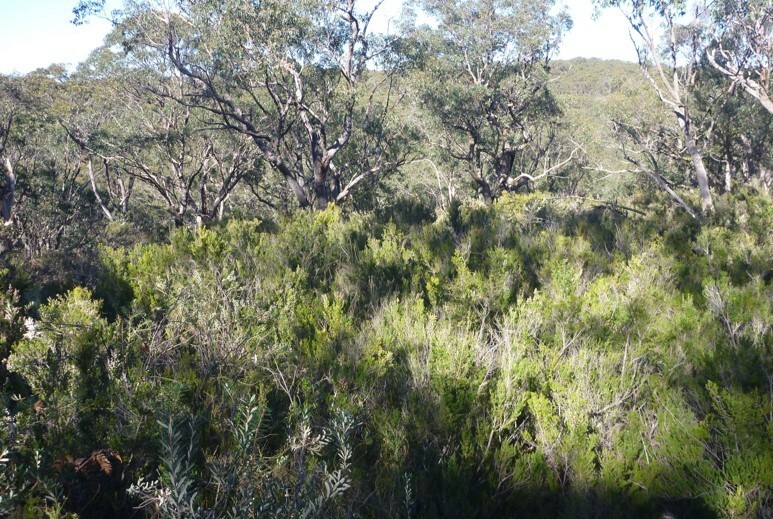 Example 2: Figure 4 shows successful tree heath (Erica arborea) control in an otherwise intact woodland in the Adelaide hills. Six months prior to burning we cut and disturbed the stand of Tree Heath on this site to ensure all the biomass would burn; that we wouldn’t have the adults sitting up high above the flame dropping seed onto burnt ground (which often happens when burning under mild conditions); and, to promote juveniles which would then be burnt and killed during burn. The other benefits of this approach are that it also promotes native germination and makes follow up, post-burn easier. Fig 4: Erica control site showing before being burnt or cut, after being cut and post burn. 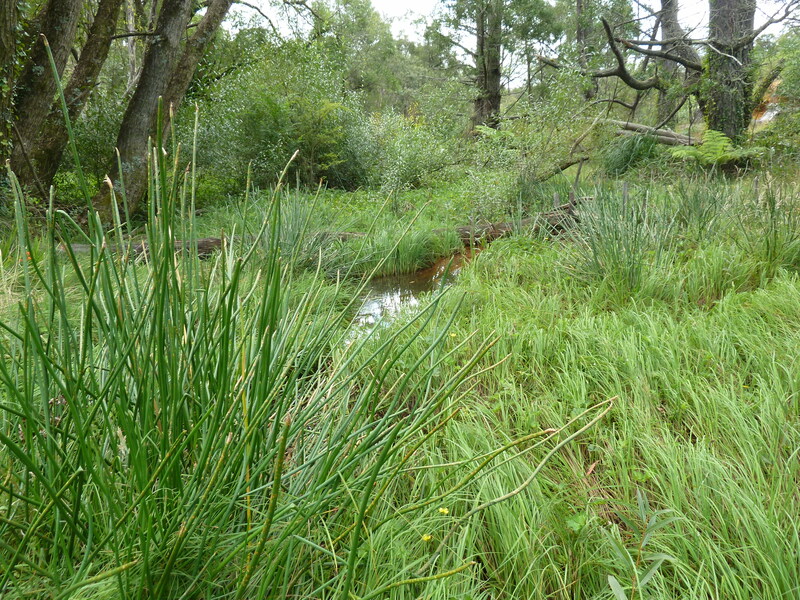 Example 3: Figure 5 shows a perched swamp in the Adelaide Hills being thickly invaded by Wonnich (Callystachys lanceolata) from Western Australia. Because of location of the site we were unable to burn the swamp at sufficient intensity to consume the Wonnich. So in this situation we burnt the surrounding area in spring in mild conditions within prescription. We later went back in autumn after we had dropped all of the Wonnich on the ground and we burnt that swamp at a very high intensity and consumed all of the biomass. That promoted mass-germination of the weed. We’re then dealing with one age-class and we can go through and hand weed, spot spray, and re-burn areas to control the germination. 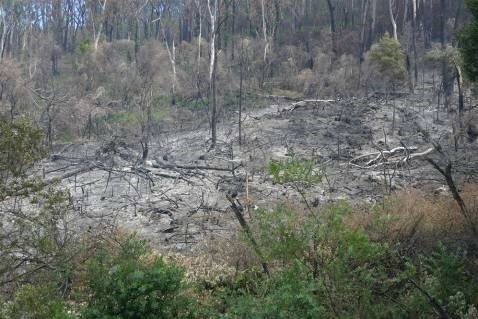 Joe Quarmby, Threatened Flora Ecologist, was the mastermind behind this burn and continues to drive follow up control work at the site. Fig 7. Swamp burnt in drier conditions during autumn (after surrounding area burnt in more mild conditions in an earlier season). Fig. 8. Follow up control work in swamp. Lessons learned. Burning can be a very useful tool for weed management and although no site is ever the same we have been able to use a variety of techniques for certain weeds which greatly increase our efficiency. The key point however is that weed control should be and is routine and needs to be thought about pre-burn. Acknowledgements. Thanks is extended to Joe Quarmby, Threatened Flora Ecologist. 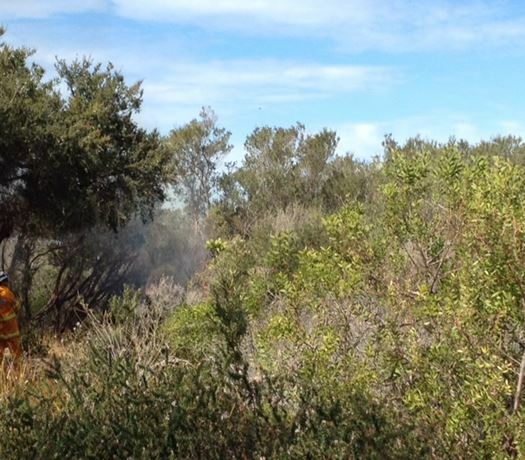 Eastern Suburbs Banksia Scrub (ESBS) is an Endangered Ecological Community that only exists in the eastern part of the Greater Sydney area – between North Head and La Perouse. From an original estimated area of 5300 hectares there’s only 146 hectares of this community left. From the 3% that’s actually left only 18% of that ESBS is on managed lands. A lot of it is in areas like golf courses, people’s backyards along coastal parts in the Sydney eastern suburbs and small pockets on Council reserves, most locations of it are quite sparse in area, with the North Head community being the largest portion in total area remaining. In 2004, the key stakeholders developed a recovery plan for ESBS, with National Parks working with other land management agencies to try and protect and manage this community. One of the recommendations from the plan was high intensity burn at an 8-15 year rotation. 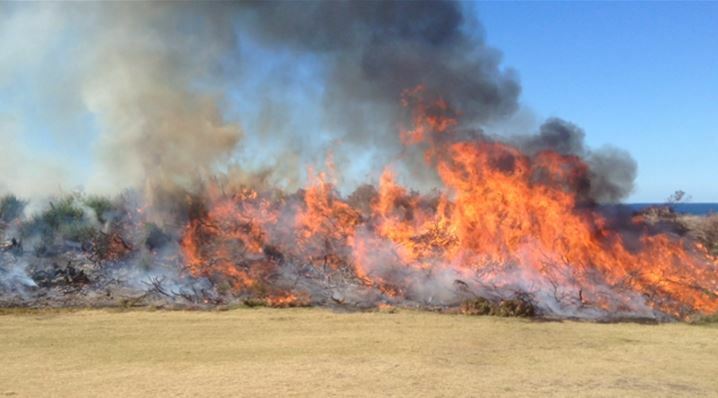 Fire and Rescue New South Wales (NSW) are re-introducing fire as a tool to restore ESBS at three sites: broad area burning at North Head, some windrow burning at La Perouse on the site of the NSW Golf Course and pile burning at Centennial Park in the Moore Park area. This involved three types of burns: an area burn, windrows and burn piles. 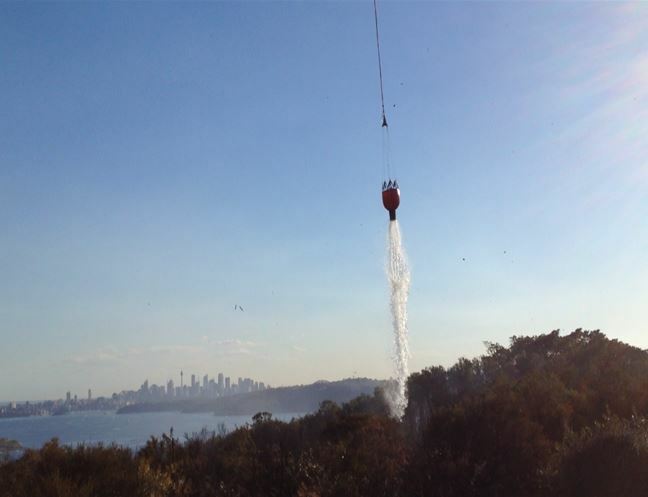 A burn was conducted at North Head, Sydney Harbour in early September 2012. This was done in collaboration with National Parks and Wildlife Service, the Sydney Harbour Federation Trust and also the North Head Sanctuary Foundation. Interestingly, the location of the fire is very close to the location Dr Geoff Lambert has identified as the site European people in Australia first recorded their observations of fire being used by Indigenous people on the 28th May 1788. Methods and risk management. 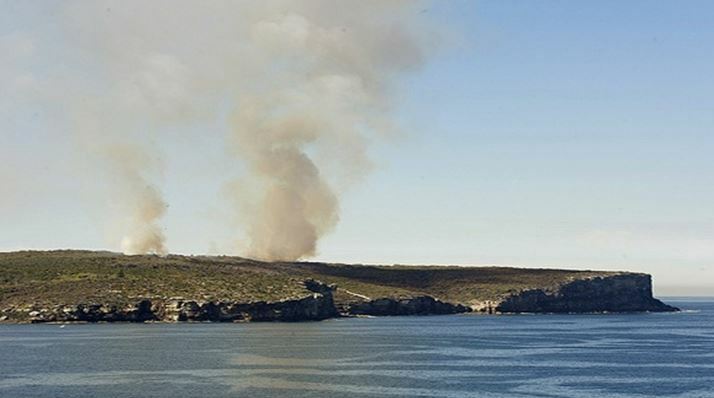 At North Head, three relatively small burns were conducted: third quarantine cemetery (0.8 ha), North Fort (1.5 ha0 and Blue Fish Drive (1.8 ha). These involved very high levels of operational logistics and operational planning, prior to waiting for the appropriate burn conditions. (a) Public safety. Because of a history of fires getting out of control at North Head, precautions involved restricting public access to the headland, which meant confining all three burns to 1 day to minimise disruption. There was an overall incident controller, Superintendent Kel McNamara for the North Head complex, plus divisional commanders in charge of each of the burns. The divisional commanders essentially were running their individual burns managing their operations officers and resources required. From this we ended up with 10 firefighting appliances (trucks) and (including the incident management and logistical appliance) we had a total of 36 resources contributed by three agencies: Fire and Rescue NSW, National Parks and Wildlife Service and Rural Fire Service Pittwater-Warringah. With all of that we had 121 fire fighters for our very small sites. State Emergency Service assisted us with closing down walking trails and making sure people weren’t actually coming onto the headland. We had a fire truck (Flying Pumper) sitting there as if it was in a fire station, so if any spot fires occurred they could go and deal with the fire and we could still carry on with our prescribed burning that we were undertaking. (b) On the day of the burns there were 400 kids on the headland, which was worrying. I tried to encourage them to go into Manly for the day but they wanted to stay on the headland for their planned activities at the Quarantine Station. Because of that I then had to go through steps in the local emergency management plan and arrange with Sydney Ferries to make sure there was a ferry ready and available in case we needed to evacuate the headland as we could only evacuate by water. Also we had to speak with Harbour Control in case the fire got away and we had to shut down the shipping channels coming into Sydney Harbour. (c) Heritage protection. We obtained mitigation funding through the NDRP National Disaster Resilience Funds to do some mitigation work around North Head’s historical stone walls criss-crossing the headland. This involved some clearing along those walls to protect the historical significance of them and this clearing doubled to create a strategic fire advantage zone over the headland. (d) Miscellaneous risks. Among the other things I had to deal with was underground ventilation. There’s historical war tunnels through North Head with ventilation intakes that I had to make sure were covered and insulated so we weren’t dragging smoke into the underground tunnels, increasing the carbon monoxide load down there. This was so if people walked in there after the burns they weren’t going to asphyxiate themselves. The bonus carry over from Defence was possible unexploded ordinance out on the headland. Furthermore, the Sydney Water treatment plant opposite the blue fish drive burn involves an above-ground storage tank of highly explosive biogas. (e) We could only burn in certain seasons. The breeding seasons of the Endangered population of Long-nosed Bandicoot (Perameles nasuta) and also the penguins had to be considered. This also involved working in with studies of these that were being done by the University of New South Wales, researching the bandicoot’s pre and post-fire introduction. Then we had to put in a notification strategy. The weather window, given all the other constraints, was very narrow. We put out an email notification system where we were literally going to give people anything from 24 hours notice up to 48 hours notice to actually go ahead with the burn. This high level of risk meant that I had to win the confidence of senior management of Fire and Rescue NSW to support the burn. We did get that support as well as support from all the other land managers, which was fantastic. Burns themselves. In terms of the burns themselves, once the fire got into the burn area it developed to very good intensity. It was a very high fuel load situation and one interesting challenge was to try and stop the fire fighters from putting the fires out. The buildings were quite close and they were very small parcels of burns. Ecological context. The burns that we did on North Head involved a range of experimental treatments that included burning, controlled thinning and untreated controls; with some sites fenced from rabbits, a study conducted by Dr Judy Lambert. We burnt on a small scale to start with to see what type of regeneration we were going to get from broad area burning out on the headland. The regeneration that we’re getting out at North Head is outstanding. But the biggest problem that we have is the newly sprouted post fire vegetation degradation from rabbits and the bandicoots. So we suggest for any burning in ESBS, the advice is that it needs to be fenced post-burn to encourage the regeneration to thrive. 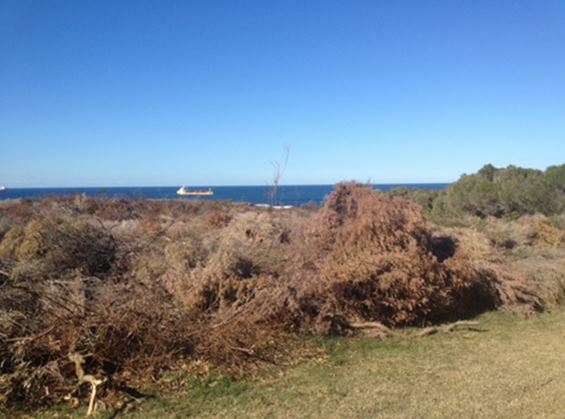 At the New South Wales golf course at La Perouse the dominant species, Coastal Tea Tree (Leptospermum laevigatum) was cut and dropped on the ground. They let it cure and then they come in and burn it in isolated pockets. Burning on the golf course is a lot easier than North Head because there are far fewer risks to plan for and manage, and the eastern boundary is the Pacific Ocean. With this type of environment and preparation we can get extremely high intensity burns which are required for the ESBS. Once again the land managers fence the area to stop exposure to rabbits. 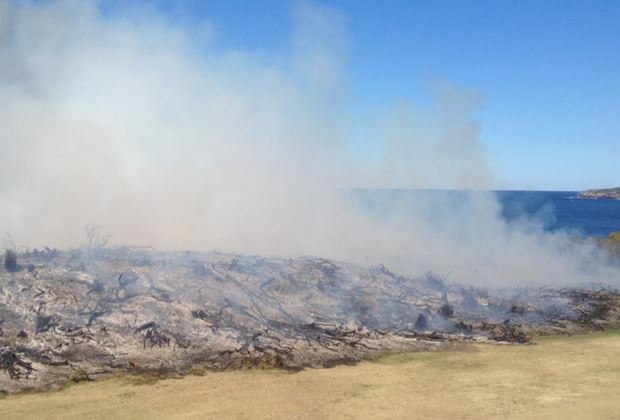 At the La Perouse golf course site, we had arson this fire season so we had an additional 21 hectares of wildfire. We’ve put measures in place to monitor what introduced fire has done compared with what wildfire has done in the same vegetative area along Henry Head. Centennial Park, in the middle of Sydney, has an area of ESBS which is not even a hectare. The Park’s owners, the Centennial Park Trust, have been manually clearing weed from the ESBS, piling it and then conducting pile burns on the area, spreading the ash from that. Once again some really good regeneration has occurred there and the burn area is also fenced off to stop rabbits. 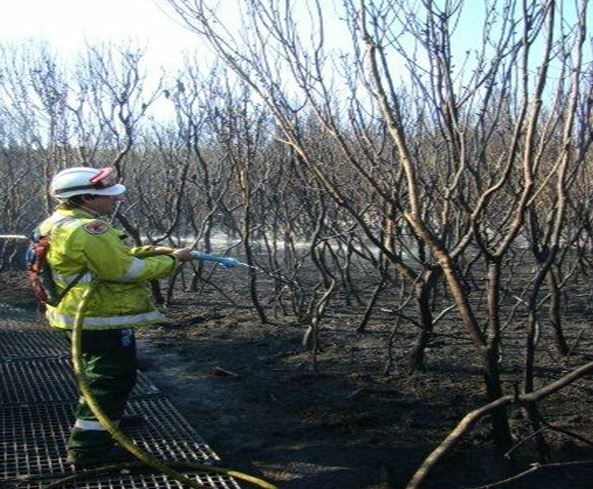 That’s our story of how Fire and Rescue NSW has been involved in broad area burning, windrow burning and pile burning, working with land managers for the recovery of Eastern Suburbs Banksia Scrub. Acknowledgements: Fire and Rescue NSW acknowledge this project could not have happed without the collaboration of National Parks and Wildlife Service, the Sydney Harbour Federation Trust, North Head Sanctuary Foundation, Rural Fire Service Pittwater Warringah, Road and Maritime Services, NSW Police, Manly Council, Sydney Water, Sydney Ports, Sydney Ferries, Harbor Control, Department of Defence and many others. 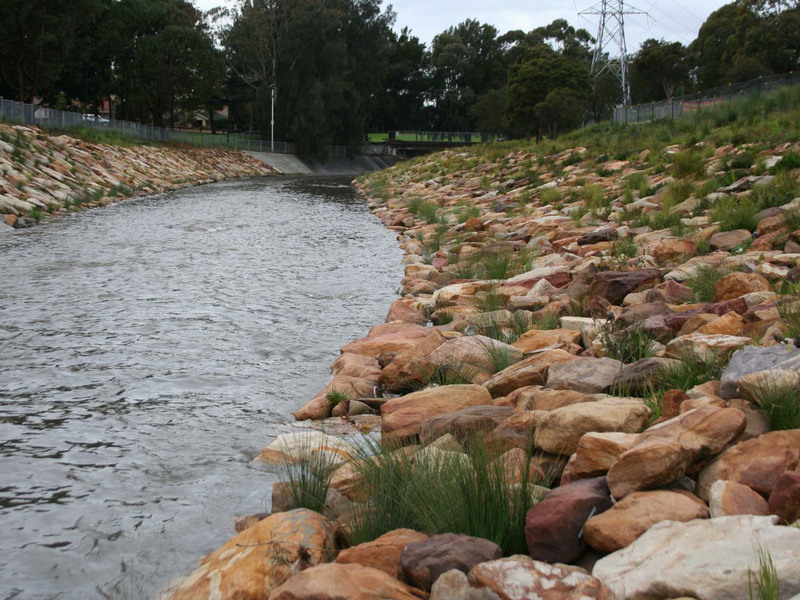 Twelve years of healing: Rehabilitating a willow-infested silt flat – Stormwater Management. Posted on 9 May 2015 by teinm | Comments Off on Twelve years of healing: Rehabilitating a willow-infested silt flat – Stormwater Management. Introduction: Popes Glen Creek is a small permanent stream rising close to the centre of the township of Blackheath, NSW, Australia. Its upper catchment (10 ha) comprises low-permeability urban development, roadways, shops and parklands. to stabilise the head wall. Figure 1: Notched weir diverting water towards sedimentation pond. 1. Diversion of part of the flow and capturing sediment. 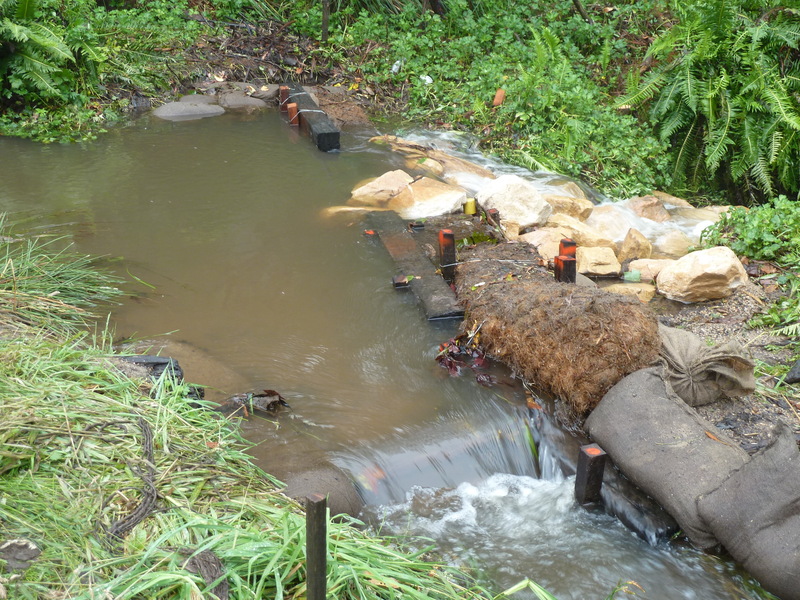 A diversion channel was constructed with flow regulated by a notched weir in the main stream. This diverts approximately half the volume of the flow into a sedimentation pond were silt is captured, reducing the quantity deposited downstream (Figures 1 and 2). 2. Construction of low-impact detention cells. “Soft engineering” detention cells constructed across the silt flat from coir logs and woody debris found on site retain and slow the release of flow, dispersing it across the silt flat and raising the water table, suppressing weeds and supporting the vegetation of the created wetland (Figures 3 and 4). 3. Elimination of the highly incised main channel. Natural debris falling into the main channel creates a series of small pondages. These retain and slow the flow and allow overflow to disperse across the silt flat. (Figure 5). 4. Protection of the creek banks. Dense plantings of deep-rooted swamp vegetation e.g. Red-fruited Saw Sedge (Gahnia sieberiana) and Black Wattle (Callicoma serratifolia) (Figure 6), and loosely woven structures constructed from woody debris (Figure 7) protect creek banks and silt flat from erosion and scouring. 5. Stabilisation of the headwall. 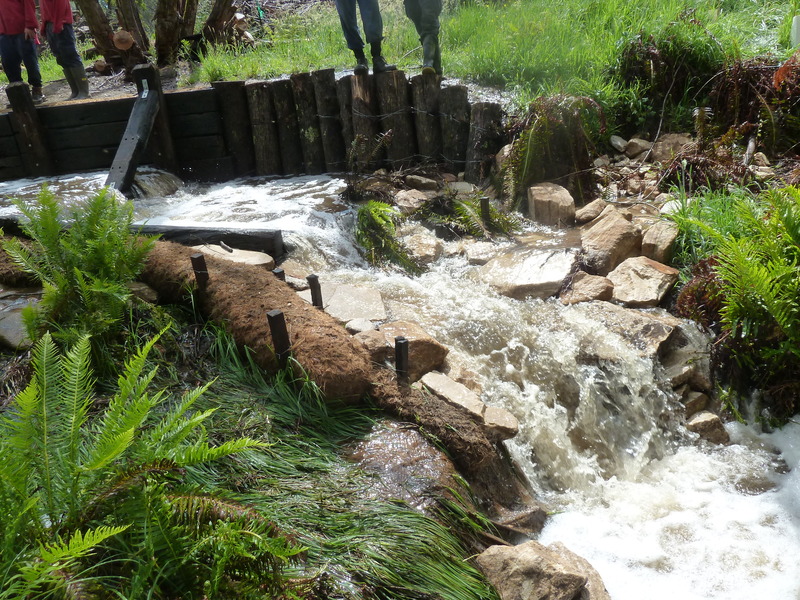 Contractors employed with funds from the Environmental Trust have constructed a major structure with railway sleepers and rock armouring to stabilise the head wall (Figures 8 and 9). Figure 3: Volunteers building a detention cell from woody debris found on site. Figure 4: Raised water table enabled wetland sedges (Carex gaudichaudiana and Eleocharis sphacolata) to displace Creeping Buttercup (Ranunculus repens). Lessons learned and future directions: This project is on track to replace the forest of willows with wetland vegetation, transform a highly incised creek and weed-infested silt flat into a healthy Upper Blue Mountains Swamp – an endangered ecological community scheduled under the Commonwealth’s Environment Protection and Biodiversity Conservation Act 1999. 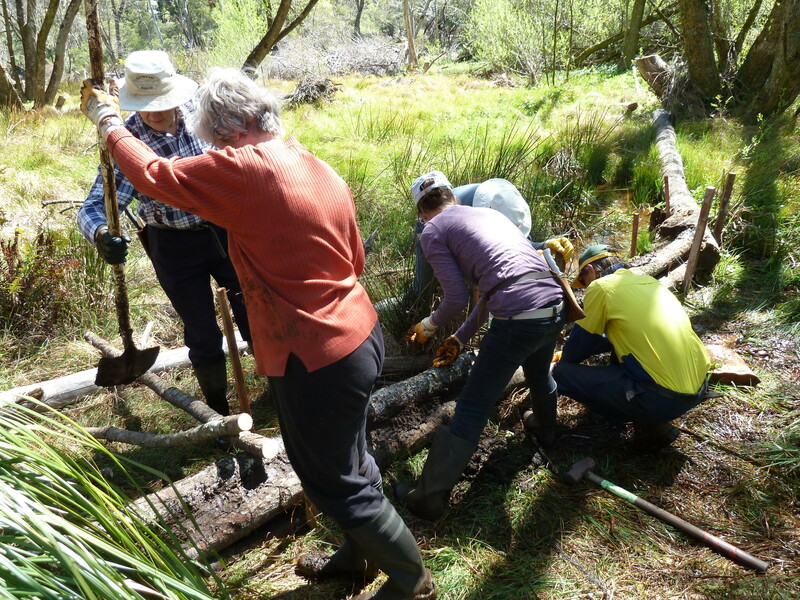 The volunteer group will continue working with Council and contractors to complete the planting program and to monitor the evolution of the site, including its vegetation, water quality and colonisation by macroinvertebrates, birds and frogs. 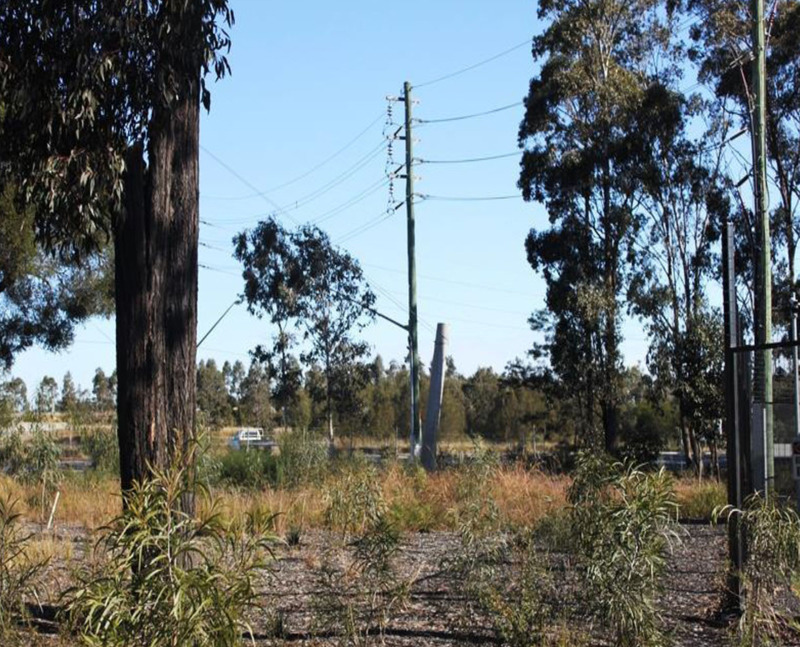 Stakeholders and funding bodies: This work is supported by a grant from the Government of New South Wales through its Environmental Trust and by the Blue Mountains City Council, which also oversaw the engineering works. All photographs: Alan Lane and Paul Vale. 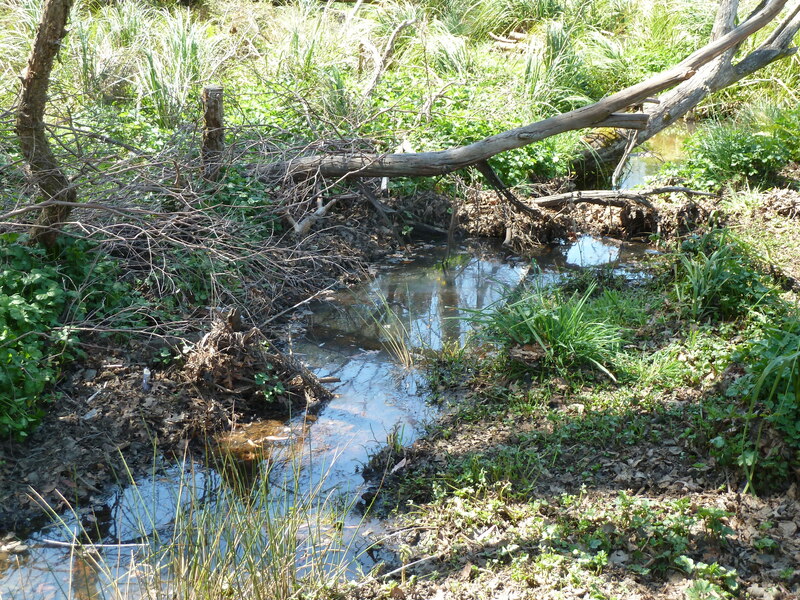 Figure 5: A natural pondage formed when debris was allowed to remain in the stream. 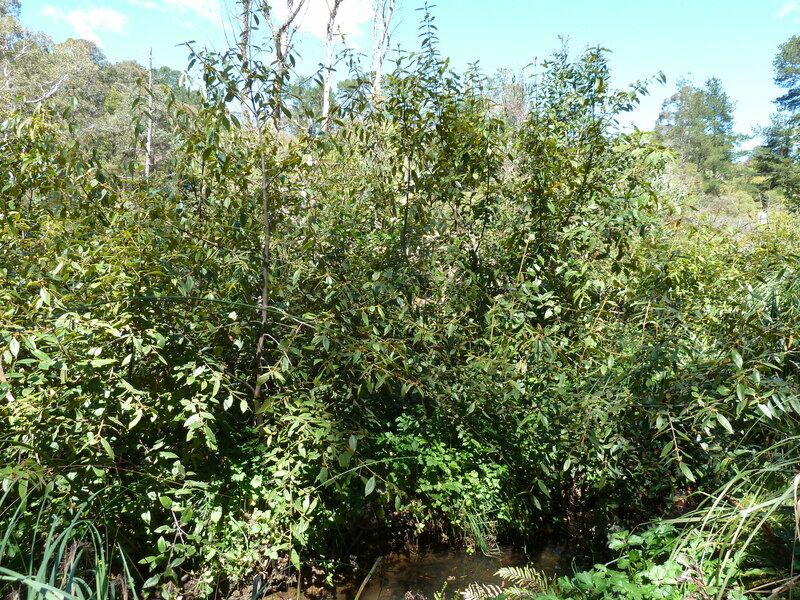 Figure 6: Dense plantings of Black Wattle (Callicoma serratifolia) and Gahnia (Gahnia sieberiana) protect creek banks from erosion. 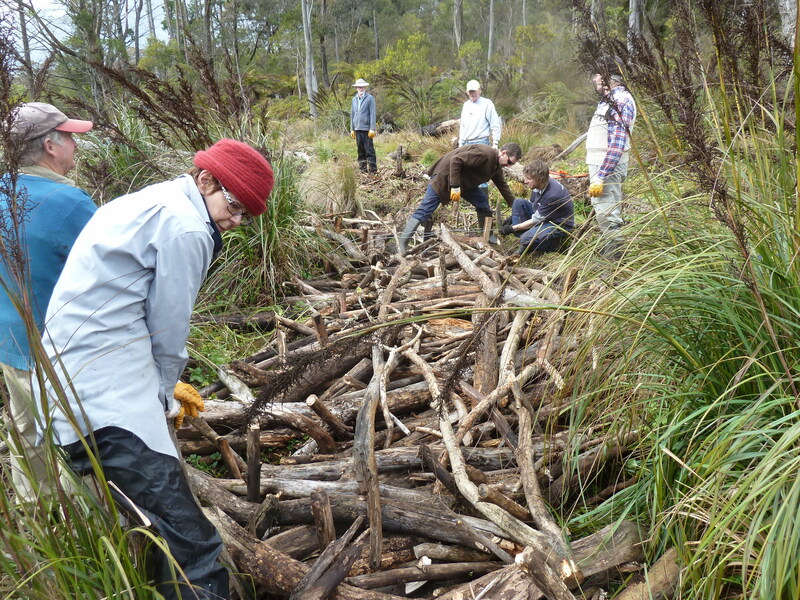 Figure 7: Volunteers using woody debris to protect the silt flat from scouring. Figure 8: Part of the original head wall approximately 3 m high and 20 m wide. Figure 9: Part of structure constructed to stabilise the head wall. Contact information: Dr Alan Lane, Coordinator Popes Glen Bushcare Group, PO Box 388, Blackheath NSW 2785, Australia. Tel: +61 2 4787 7097; Paul Vale, Deputy Coordinator Popes Glen Bushcare Group, 81 Prince Edward St, Blackheath NSW 2785, Australia. Tel: +61 2 4787 8080; and Ray Richardson, Chairman of Steering Committee, Environmental Trust Grant 2011/CBR/0098. Tel: +61 2 4759 2534. Comments Off on Twelve years of healing: Rehabilitating a willow-infested silt flat – Stormwater Management. Purpose of the project. 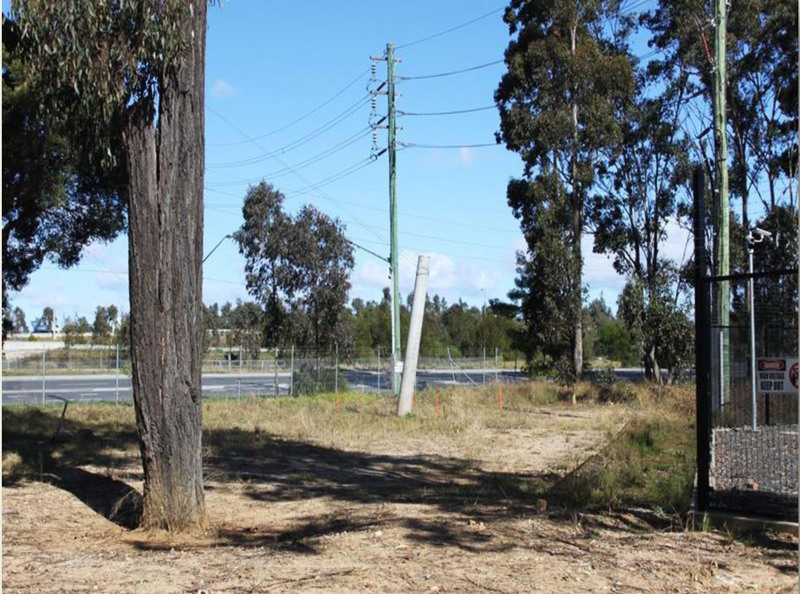 Endeavour Energy sought to restore a small highly disturbed Cumberland Plain Woodland bushland remnant at the West Liverpool Zone Substation at Hoxton Park, to offset 12 native trees removed to facilitate construction works at their electricity substation. Condition of the site. The Cumberland Plain Woodland remnant was very small (approx.0 3.ha) and contained relatively healthy examples of four native trees (Grey Ironbark Eucalyptus crebra, Grey Box E. moluccana , Forest Red Gum E. tereticornis and some Paperbark Melaleuca decora). However, the native shrub and ground layer was generally absent and the soil surface was highly compacted with a low organic matter content. This was due to historic clearing for agriculture, recent clearing for the installation of electrical infrastructure and the fact that a layer of coarse fill material and asphalt had been deposited over the topsoil in some areas (probably for car parking). Goals. As we found fragments of 3 grasses and 6 forbs remaining on site, our goals were to protect and enhance all remaining plants by ecologically sensitive weed control and planting of missing species from the Cumberland Plain Woodland community. We had 24 months to achieve the revegetation, with performance criteria being: a survival rate of >80%; a reduction in the percentage cover weed to < 5%; and, an increase in percentage cover of the herbaceous layer to 67% – 100%. What we did. We identified two zones on site: Zone 1 – with capacity for assisted regeneration; and Zone 2 – without capacity for assisted regeneration. 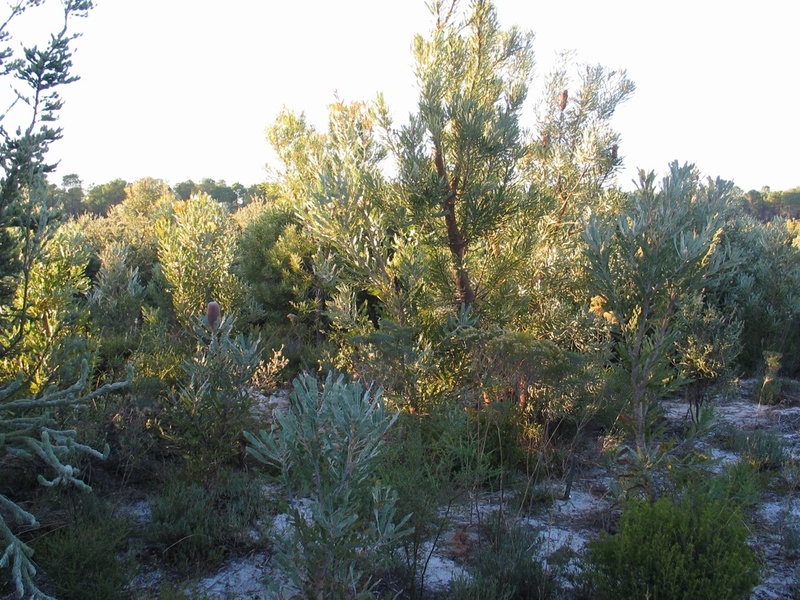 Zone 1 was treated using standard bush regeneration techniques – i.e. removal of weed to facilitate natural regeneration. Zone 2 treatments included: weed control, mulching with recycled wood waste (2,600m2 x 100mm deep); planting with 9,100 native tubestock (3-4 plants /1m2) raised from Western Sydney seed; and watering throughout the first month. What advice can we offer? 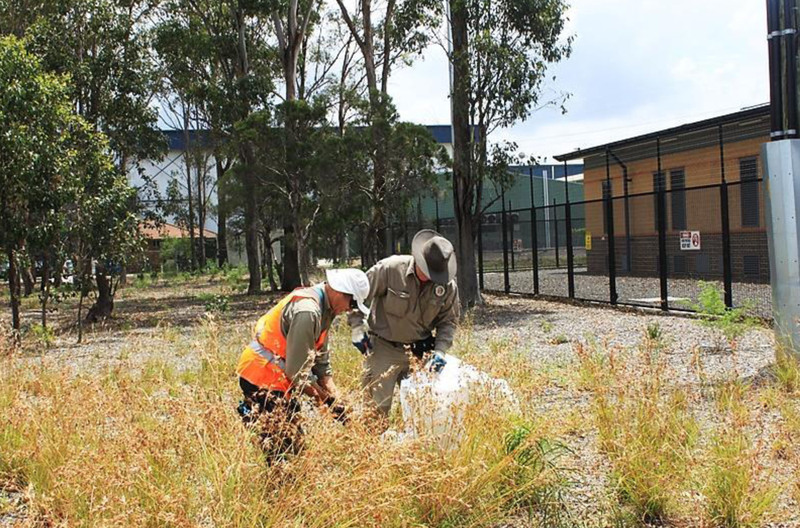 Always check your project site to identify any fragments of native species which may be present and protect them during weed control works, particularly when spraying herbicide. Use good quality tubestock of the appropriate provenance and budget for a seed collection program if the project timetable allows. Never underestimate the need to water tubestock during hot months and allocate sufficient resources to watering. Acknowledgement. This is summarised from a talk first presented to the symposium ‘Rebuilding Ecosystems: What are the Principles?’ Teachers’ Federation Conference Centre, November 13th, 2014, Australian Association of Bush Regenerators (AABR). The site: Popes Glen Creek is a small permanent stream rising in Memorial Park, Blackheath New South Wales, Australia. It flows through Popes Glen Bushland Reserve and the Greater Blue Mountains World Heritage Area (GBMWHA), joining the Grose and Hawkesbury/Nepean River systems. 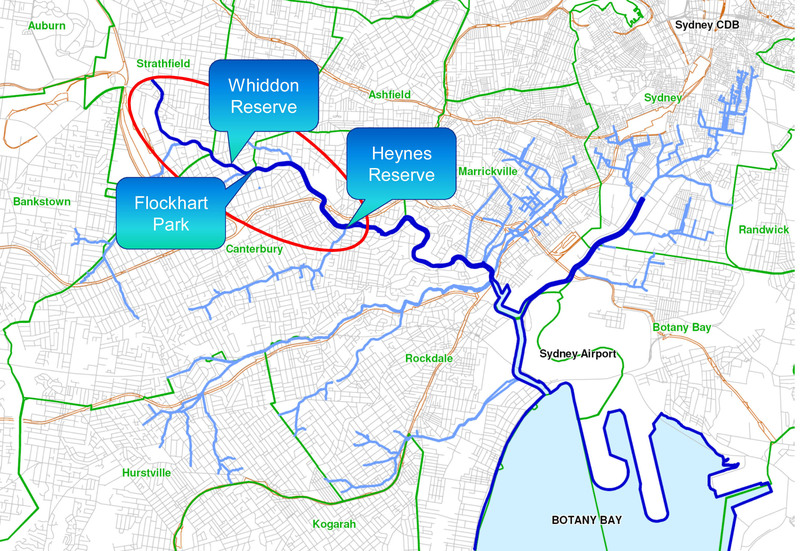 The upper catchment drains a significant sector of the urban township of Blackheath. 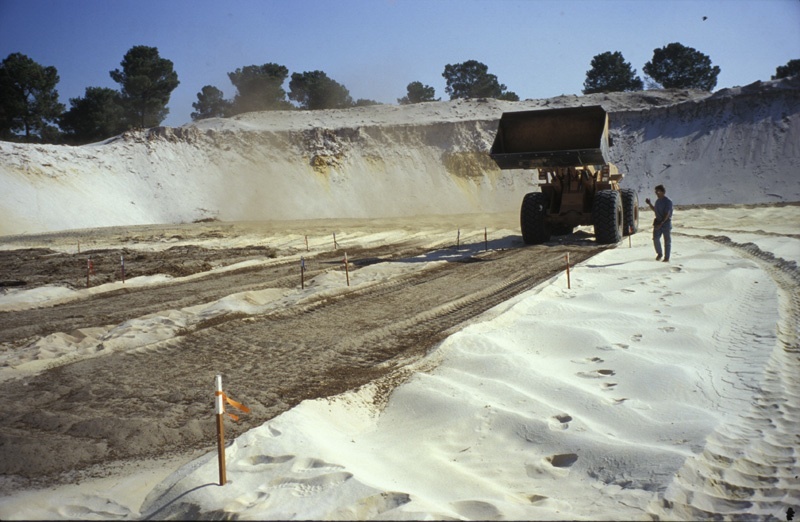 The problem: Decades of erosion from surrounding unsealed roads resulted in a 1ha silt flat forming at the headwaters of the creek and terminating in a highly incised headwall 3m high and 20m wide. 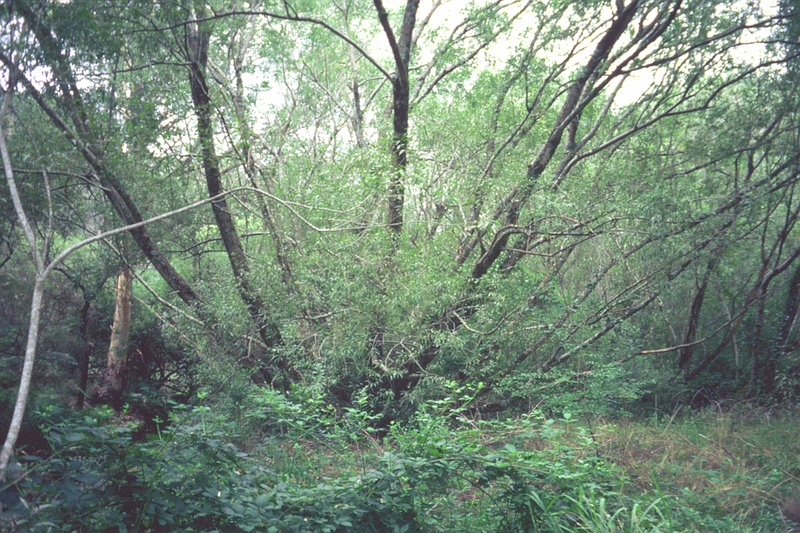 Upstream, the silt flat and severely braided creek were populated by a dense forest of mature, multi-trunked specimens of Crack Willow (Salix fragilis), as well as thickets of Purple Ossier (S. purpurea), Small-leaf Privet (Ligustrum spp. ), Holly (Ilex aquifolium), Cotoneaster (Cotoneaster spp.) and immature S. fragilis. There was also a ground layer of Montbretia (Crocosmia x crocosmiiflora), Blackberry (Rubus fruticosus agg), English Ivy (Hedera helix), Creeping Buttercup (Ranunculus repens) and Honeysuckle (Lonicera japonica). 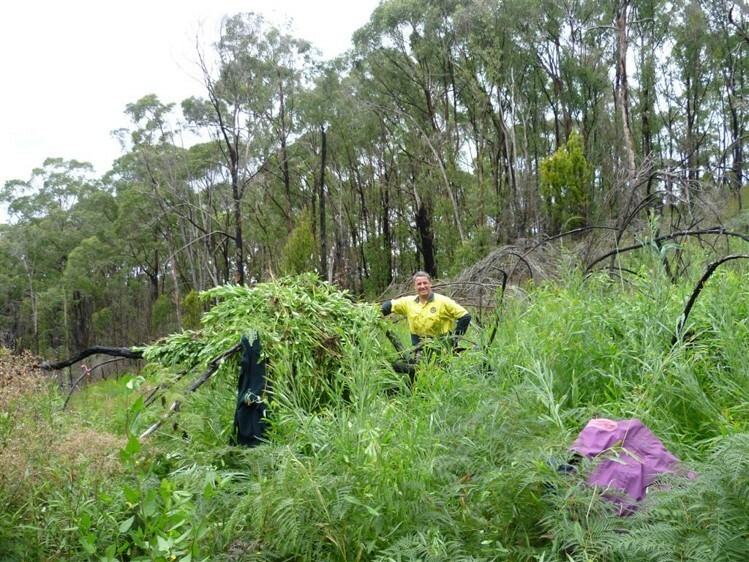 This dense and complex infestation of weeds threatened to spread downstream into susceptible remote areas of the GBMWHA, where it would rapidly become extremely difficult to remove and would ultimately threaten the Grose and Hawkesbury-Nepean River systems. Fig 1. Feb 2005 – the creek bank, dominated by weeds prior to work. Fig 2. Sept 2014 – same site nearly 10 years later, showing established plantings and some natural regeneration. 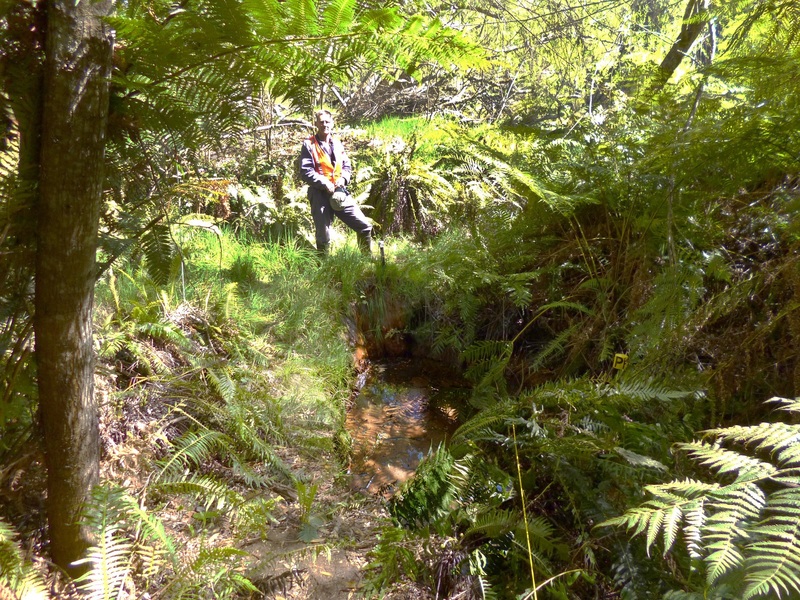 Works carried out: Phase 1: 2002 – 2008 In 2002, the Pope’s Glen volunteer bushcare group, supported by Blue Mountains City Council and funding from the Urban Run-off Control Program, established trial plantings on four sites (100m2 each) to identify a limited range of local riparian and wetland species and the planting techniques best suited to revegetating and stabilising the silt flat. The species included Red-fruit Saw-sedge (Gahnia sieberiana), three teatree species (Leptospermum lanigerum, L. polygalifolium, and L. juniperinum), Broad-leaved Hakea (Hakea dactyloides), and three ferns (Blechnum nudum, B. watsii and Cyathea australis). A 3-year grant from the Environmental Trust (2005-2008) then enabled a program of weed removal and replanting, encompassing the upstream half of the silt flat and expanding the list of plant species to about 30. The weeds were removed progressively in a patchwork to preserve the stability of the silt. The willows were killed by stem injection and felled when dead. Over these 3 years, the volunteer group planted approximately 7000 plants and carried out approximately 1200 hours of site maintenance. This has resulted in a diverse and resilient wetland community, with high levels of plant establishment from both planting and from natural recruitment (Figs 1 and 2). Phase 2: 2012 – 2018 At the commencement of this phase, stability of the downstream portion of the silt flat and headwall was dependent upon the integrity of the roots of the remaining dense stands of weeds. These could be removed only as part of an integrated program of works to stabilise the silt and the headwall. A second grant from the Environmental Trust (2012-2018) is enabling an integrated, 6-year program of stabilisation, restoration and revegetation to be carried out by a team of experienced contractors, using both “soft” and “hard” engineering strategies. The volunteer group is responsible for on-going site maintenance, photography, monitoring surface water quality and water table depth and quality, and for surveying vegetation, macro-invertebrates, frogs, birds and stygofauna. Overall results. The formerly highly degraded silted flat is now a thriving community of wetland and riparian vegetation, home to a rich diversity of small birds, dragonflies and mayflies. Frogs are beginning to populate the site. Water quality has been significantly improved, with up to 85% of faecal coliforms and 75% of nitrate-N removed in the wetland. This improves the water quality in Popes Glen Creek and reduces the pollutant load into the GBMWHA. Fig 3. Feb 2013 – a portion of the headwall viewed from downstream. (Plunge pool approx.3m below. (Image Damon Baker http://www.nomadgraphics.com.au). Lessons learned and future directions: This is an example of how an apparently overwhelming challenge can be tackled by a dedicated group of volunteers with critical mass, commitment and longevity, provided that the group has support from a body such as a local Council and that it can raise funds to employ skilled assistance as needed. It is anticipated that the ambitious program of rehabilitating the extensive and highly degraded silt flat will be completed within the life of the present grant. Stakeholders and funding bodies: This work is supported by a grant from the Government of New South Wales through its Environmental Trust and by the Blue Mountains City Council. Unless otherwise stated, photographs have been provided by Alan Lane and Paul Vale. Contacts: Dr Alan Lane, Coordinator Popes Glen Bushcare Group, PO Box 388, Blackheath NSW 2785, Australia. Ph +61 2 4787 7097; Paul Vale, Deputy Coordinator Popes Glen Bushcare Group, 81 Prince Edward St, Blackheath NSW 2785, Australia. Ph +61 2 4787 8080; and Ray Richardson, Chairman of Steering Committee, Environmental Trust Grant 2011/CBR/0098. Ph +61 2 4759 2534. 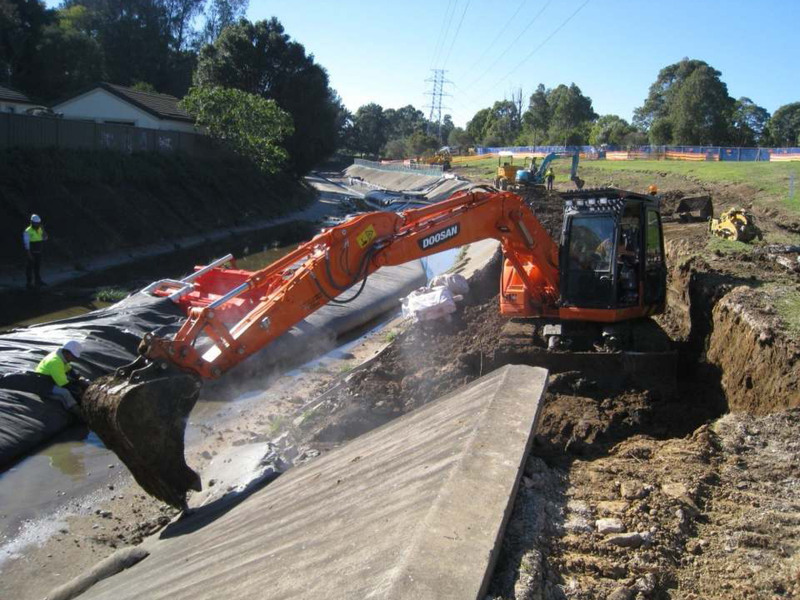 Sydney Water have undertaken a project to convert 1.1km of concreted sections of the Cooks River, Sydney Australia, to a more natural state, substantially improving their potential for aquatic function and the provision of services to surrounding residential areas. The problem and its causes. 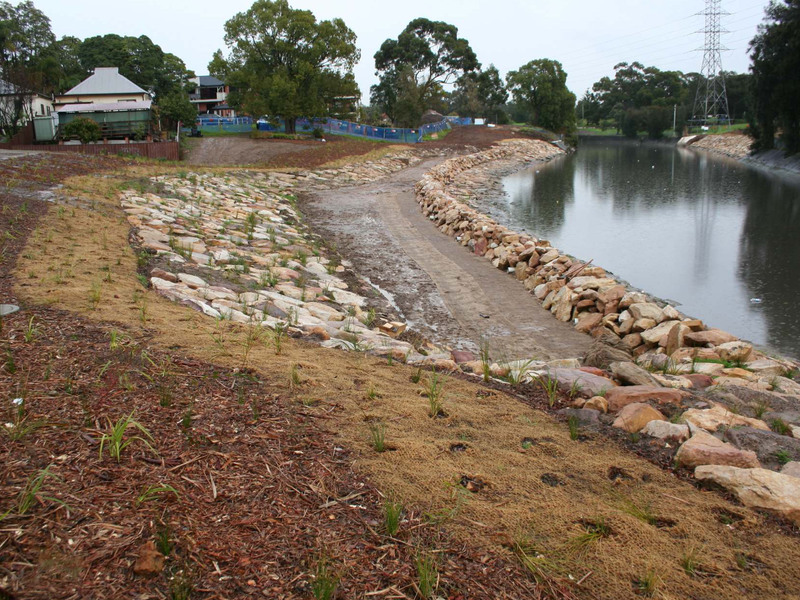 Seven kms of the highly urbanised Cooks River were concrete lined in the 1940s in an effort to alleviate flooding and reduce water pollution. Since that time the natural values of the river have declined due to pollution and lack of riparian remnant vegetation. 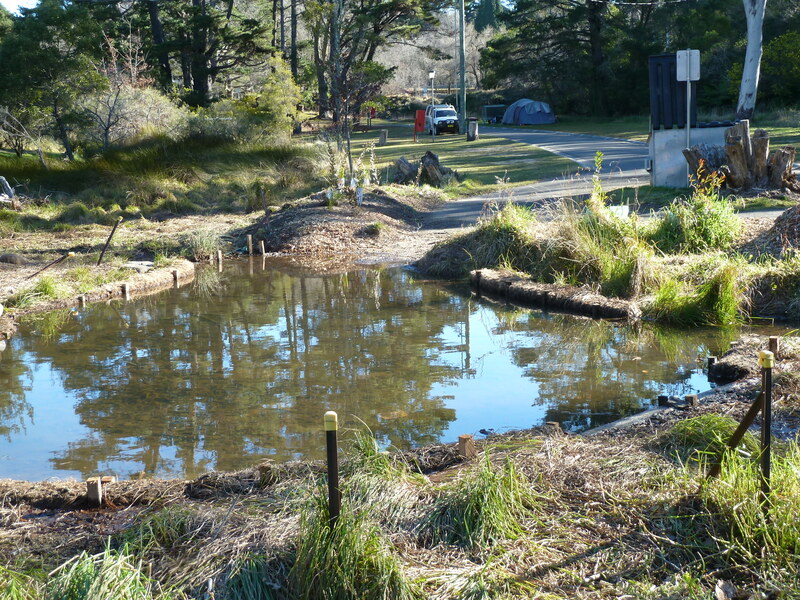 Community interest in the quality of the environment had increased since the 1940s and, the structure of the concrete began to significantly deteriorate, in 2014 Sydney Water removed sections of deteriorated concrete and undertook environmental rehabilitation of parts of the riparian zone. What we did. 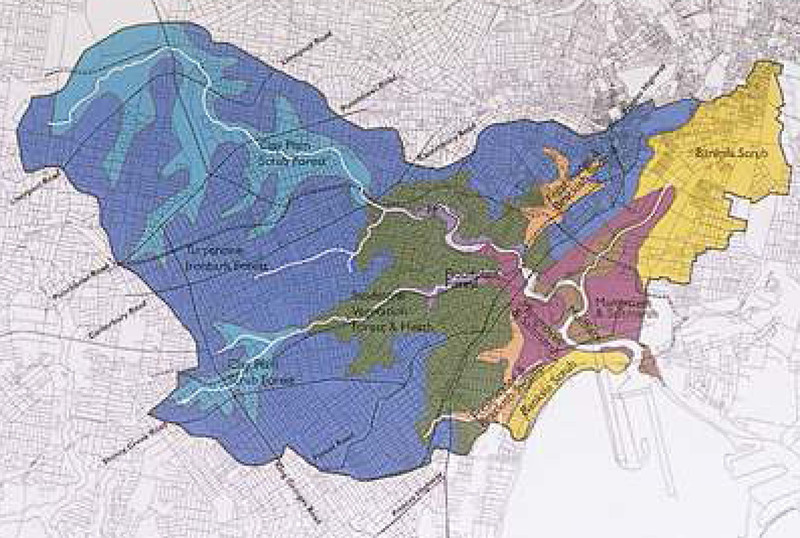 Between 2007 and 2013 Sydney Water carried out a masterplanning exercise that included asset inspections, hydraulic analysis, stakeholder consultation and concept design development; in order to identify sites along the river that were suited to renewal and naturalisation (Fig 2). Results. 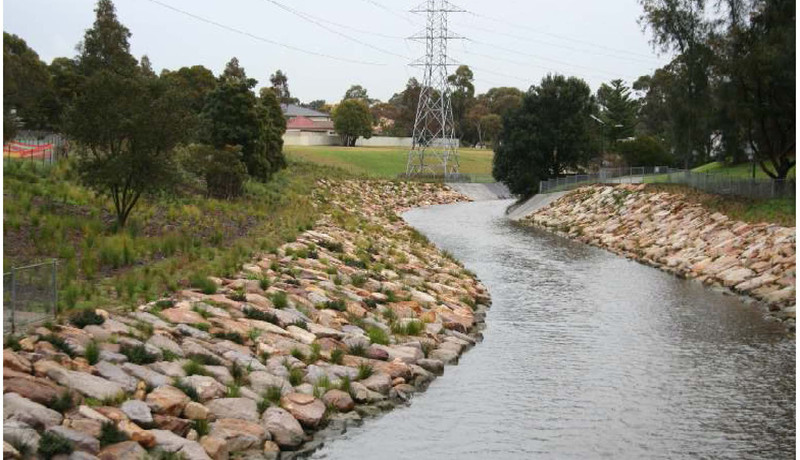 The project resulted in the reconstruction of a diversity of native riparian habitat types and improved connectivity for biota between reaches of the river that were previously disconnected. This resulted in massive aesthetic improvement, with local residents conveying much improved local area pride and positivity. The project provides a social amenity, with the provision of pathways, seating, interpretive signage and provides an opportunity for local communities to reinstate a sense of place and reconnect with each other in the context of a natural river. In addition it represents value for money considering that longer asset life produced by the natural system. Fig 6. Works inlcuded floodways devoid of trees. WATCH THE VIDEO: from symposium ‘Rebuilding Ecosystems: What are the Principles?’ Teachers’ Federation Conference Centre, Sydney, November 13th, 2014, Australian Association of Bush Regenerators (AABR).